lt;stronggt;RCPA21206WHIlt;/stronggt;lt;BR/gt;Rubbermaid Web Foot Shrinkless Looped-End Wet Mop Headlt;BR/gt;Contains antimicrobial protection, which inhibits the growth of bacteria that causes odors and stains. Withstands repeated launderings without shrinkage, while looped ends and tailbanding reduce tangling for like-new performance after every wash. Colorfast fibers will not shrink or fade with repeated launderings. Pre-laundered and pre-shrunk for longer product life. PVC-coated mesh headband prohibits moisture penetration and resists chemicals. 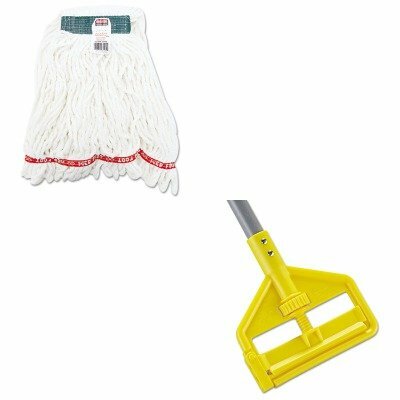 Head Type: Wet Mop Application: Floors Mop Head Style: Looped End Mop Head Size: Medium.lt;BR/gt;lt;BR/gt;lt;stronggt;RCPH146lt;/stronggt;lt;BR/gt;Rubbermaid Web Foot Shrinkless Looped-End Wet Mop Headlt;BR/gt;Easy-change, side-gate design allows you to quickly slide mop heads on or off. Adjustable thumb wheel enables stress-free, tight and secure clamp down. Solvent- and acid-resistant frame enables use with all commercial floor stripping agents. Handle Length: 60amp;quot; Handle Diameter: 1amp;quot; Handle Material: Fiberglass.